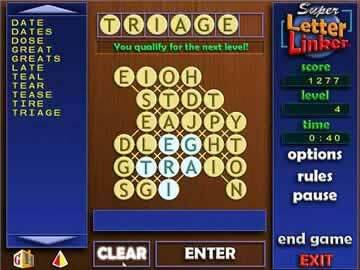 Super Letter Linker Game Review - Download and Play Free Version! Form words from letters linked together - just like Boggle! Challenging and thought-provoking word game. Two game modes for both pressure seeking and casual players. Two difficulty levels open this game up for players of varying skill levels. Little to no difference between timed and untimed mode. Doesn't branch out or differentiate itself from other word games on the market. In Super Letter Linker, there are 2 game modes to challenge your word making skill. In the both versions, you must form words from the letters provided. However, you can only make words from letters that are right next to each other or linked. The timed version challenges you to make as many words as possible in the time provided. In the "Find All" version, you must try to make all the words available. Super Letter Linker is a word game that will have you connecting adjacent letters to form words of three letters or greater. There are two game modes in this game and the object of game is to form as many words as you can in the allotted amount of time. This is a challenging word game that provokes thought through “super linking letters” as quickly as you can. 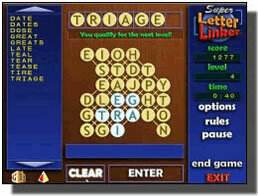 In Super Letter Linker you are faced with a game space of random letters which change level to level. Both diagonal letters and ones on top and next to each other are connected in this game. Through clicking on a letter, and then on its neighboring letters you form words. For example, if a C, A, and T are all connected, either by a diagonal or direct neighbor, these letters can be connected to form the word CAT. Since larger words are more difficult to form, words like CAT are worth less points and take longer to advance you to the next level. This game is comprised of two different game modes with essentially the same objectives. In the first mode, Time Trial, you are racing the clock to score as many points as possible in the allotted time. You are given two minutes and a large game board and your goal is to form words, lots of words. The larger the word, the more points you receive. It's not crucial to uncover all the letters in this mode, however, being fast and thinking on your toes is essential. The second mode, Find All, takes place on a game space comprised with fewer letters. In this game you need to find all the words in the puzzle in the least amount of time possible. The typical game board is only 16 letters long, much less than in the timed mode; however, this game still poses quite a challenge. Finding all the words can be extremely difficult to do. Luckily you are not under the pressure of a clock, so relaxing and taking your time with this mode is possible. Though it poses quite a challenge this game mode is much more calming and geared toward the casual player. As far as drawbacks are concerned this game has a few that make it less competitive in the overly crowded word game genre. 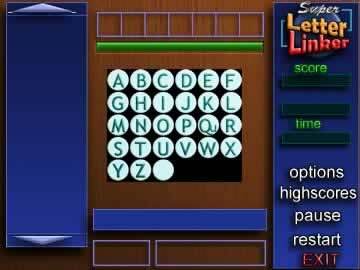 The simple nature of the game make Super Letter Linkers not at all unique, and it certainly doesn't set itself apart from other games. With little to no difference from other games on the market this game is not a must play, taking away from its overall quality. Another problem with this game, which is a downfall of many word games, is monotony. The simple style of gameplay, which doesn't change, makes this a game that can easily become boring and monotonous. All in all Super Letter Linkers is an alright game that is challenging and thought-provoking. Its greatest downfall is the fact that it doesn't set itself apart from other word games in the already overcrowded genre. This isn't a bad game in the least, it's just not unique. If you're a fan of standard letter connection-like word games this is a great option for you. However, if you are looking to expand your word game pallet, you might want to keep looking.